Vintage Stan Musial, Rawlings, Three Finger, baseball glove! The Playmaker! The glove is for the left hand of a right handed thrower. The glove is marked " Deep Well Pocket, Stan, "The Man" Musial, Pro Leaguer, Rawlings, PML, Hinged Pad, The Playmaker" on the front and "Place two middle fingers in this section, Pat. Top of The Line Rawlings firstbase mitt from the late 1950's is this TM20 Heart of The Hide Stan Musial Personal model. This glove appears to be all original with rolled leather piping and smooth lining. 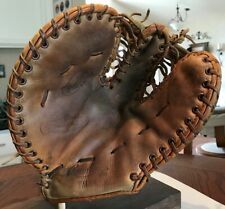 This fielder's glove is in fair condition with inner leather palm/finger stalls free of holes or tears. It is too old to use but would be great for display. It is badly worn and looks like it may have been re laced on parts. Vintage Stan Musial Montgomery Ward Professional Model Baseball Glove Display. Shipped with USPS Priority Mail. Rare 3 Finger glove. Genuine Steerhide. Made in New York City. Condition very good, no cracks, leather is healthy and flexible. Vintage Stan Musial "Stan The Man", Pro League, 3 Finger PML Leather Baseball Glove Mitt. Second finger has "place two middle fingers in thos section" on it. Laces broke between fingers. Shipped with USPS Priority Mail. Roy Sievers Trapper Model tm 85 USA Rawlings Claw Vintage Baseball Glove. Shipped with USPS Priority Mail. Previously owned. I will make it right. Vintage Stan Musial Professional Model Glove Ref #60-21200 In Fair Condition. Hawthorne Stan Musial baseball glove in fair condition. 1960'S Stan Musial Model BM76 Glove by Watkins Cottrell Co.
Beautiful 1960's Stan Musial Glove. Item includes One (1) Stan the Man Baseball Glove. This baseball glove is in great condition for its age. Stan Musial model glove is in excellent condition. This glove is very rare and hard to find. Up for your consideration, a pretty tough Stan 'The Man' Musial PMM glove box. No glove but, I'm guessing if you're looking at this item you are aware that the box is what's tough, not the glove. Box is SOLID, see photos for condition. GREAT CHRISTMAS PRESENT FOR STAN THE MAN OR BASEBALL COLLECTORS. There is a lot of wear and tear: the leather is hard and cracked/torn. STAN MUSIAL. We do add a white border. The black border. up to produce the best photographs possible. New ListingStan Musial And Red Schoendienst Baseball Gloves Circa 1950s Cardinal Greats!